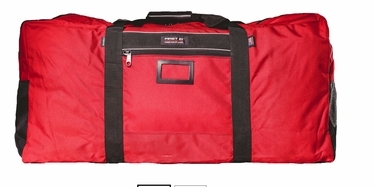 Keep your swift water gear dry and secure in our super-large size, high-visibility gear bag. Two large vents provide lots of ventilation so your gear will air out if it gets stowed before it is completely dry. Also features a large front zippered pocket. Other features include a leather handle, I.D. holder, and removable shoulder strap. Constructed of DuPont Cordura® Plus nylon, heavy-duty buckles, webbing and YKK® zippers.